Shown is a typical morning in Cassie Adkins’ class as she reads to her students at Hillsboro Elementary School. 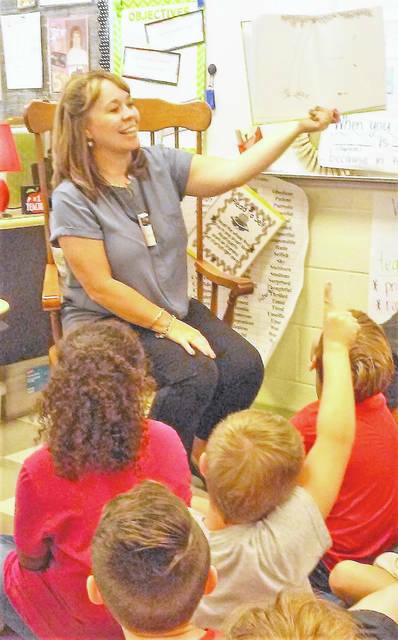 Reading is fun and fundamental in the eyes of Hillsboro elementary teacher Cassie Adkins, and that’s the approach she takes with her fourth-grade class — especially on National Read-A-Book Day, which is observed Thursday, Sept. 6. The Hillsboro native teaches reading and social studies, but previously was in the Title program at the old Webster Elementary School. “That was where a teacher brought in a whole class and they split up into little groups, and we read them a book that was on their grade level,” Adkins said. The whole idea was to instill a love for reading into students, and after 23 years of teaching, that passion is still burning bright in Adkins. If she sounds like a cheerleader, it’s because she was in high school at one point, too. “I’d be interested to see how many teachers used to be cheerleaders,” she said. In 1966, the government created Reading Is Fundamental, a program designed to combat growing illiteracy in the U.S. Adkins has her own theory as to why illiteracy rates are high today. “Politicians want to blame poverty and the kids’ environment, and I agree that that has a little bit to do with it, but a child’s love for reading comes from the adult in their life and the influence they have,” she said. The growth of video games and social media, in Adkins’ opinion, has not helped. Adkins said there is a method to her madness: she hopes to keeps her students interested and inspire them. If students can’t read or have problems with comprehension, there are accommodations available today that help somewhat, but according to Adkins, those don’t always address the underlying issue. “When my son took his driver permit test a person can have the computer read the test to them, but the problem is, when you reach the passing score, you’re done,” she said. Adkins bristles at the suggestion that any point above passing is a waste of time. To reach that potential, Adkins encourages her students to literally curl up with a good book — not an E-book, but an actual paperback or hardcover book that they can hold in their hands. Another way to motivate students is “The 40-Book Challenge,” a program currently underway to encourage students to read 40 grade-level books before the end of the school year. To aid in that effort, Adins said, Hillsboro Elementary is lucky to have what she calls “the book room,” where there are thousands of books that teachers and children alike can check out. Adkins can’t tally up how many books have “walked out” of her classroom and were never returned over the years. “If one of my kids felt like they needed to take that book home with them, that’s OK with me,” she said.